ChopperGirl's PoorGirl is built from plans using T6 aluminum tube, and chrome-moly steel where needed. There is some welding for the chrome-moly steel parts. Stainless steel rivets, and aircraft AN-x bolts hold it together. It is covered with 6 mill thick boat shrink wrap. The boat shrink wrap is held down by 2" wide boat shrink stretch tape. The trim paint is Rustolium. The motor started and ran strong, idled well. Broke prop. Stored it in my storage building over the winter. Replaced throttle cable with a push-pull cable, the old one stuck. Welded portion of tail wheel bolted to shaft. Replaced broken prop with a Tennesse 66" x 31 pitch. Wife increases my life insurance. I added two pullies to extend the start rope to the front of the wing. I rewound the pull starter with a longer rope to reach the front. Charged LiPo batteries in the GoPro, and Eagle Tree electronics. Lashed plane to a tree, and did a successful engine run up. Regapped plugs to .015 to make starting easier. Changed to a 4s 16volt LiPo so on screen video would stay on longer. Added a 12v to 5v BEC to On Screen Display to stop it from going off. 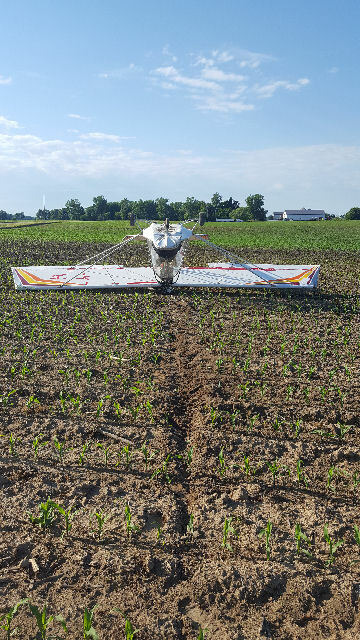 I taxi up and down the runway, and it was too rough, ground looped and broke one main axle in corn field. Replaced main axles with steel. Scraped, disked, and drug runway to smooth it. Waited on rain to help pack the loose dirt. Tried again to do a fast taxi, and the plane ground looped left into corn, then later into a tree going the other direction. Broke the frame for landing gear on right side hitting tree. At this point I'm going to convert it to trike gear and get rid of the ground loop problems. Never say die! It's mid August and the trike gear are ready. I was able to taxi straight down the runway without any ground looping, thanks to the trike gear. Also, I can now turn around in the runway width under power. The nose wheel will need replacing. I hit a mole hole and gunned it trying to go over it. That took the front wheel off the rim and bent it. The engine was moving around too much so I got rid of the slop in the rubber mounts. The muffler was really loose because of the motor movement, so I fixed that as well. Mounted much stronger nose wheel. Did a half throttle taxi test on my short runway. I was able to turn around in the 50' runway width, and made two 'laps' around without having to make repairs. It took me all summer to get this far. I could feel the front wheel getting light. If I was an experienced pilot, this would all go much faster. I turn 65 in the winter and will have Medicare before the first flight. The corn is over 8' now, and I feel I need the extra runway length, and width, so practice, practice, practice this fall. I didn't practice long before it started missing, so I put it in storage. First takeoff attempt probably late Spring 2017. I'll wait on the last snow in March, then pull it out of storage, and update the motor from point ignition to electronic. When I get it running right, I'll do a pull test to make sure it has enough power to fly me and the plane...at least 1/2 the total weight...I'll have to weigh me and the plane, and balance it again, just to be reassured...then up up and away!!! Spring is here, and I successfully updated the Rotax 503 to electronic ignition. I did a run up test and it runs better than ever. Now I am patching up the covering with new tape where needed. The Sun's UV rays ate up the top side tape. Now I know to spray it with clear. When I finish repairing the old tape, I'll reshrink the fabic using a propane boat shrink wrap gun. Tightening fabric is working well. The propane heat gun is MUCH faster than an electric heat gun. The $325 is well worth it. I'm retaping where the shrinking pulled the tape to expose aluminum tubing. Also using headliner spray glue to help hold the fabric in place. 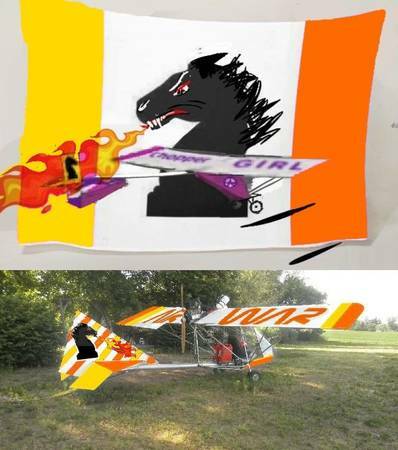 The wings will be mounted to the plane hopefully by Father's day. The latest is the take off failed. 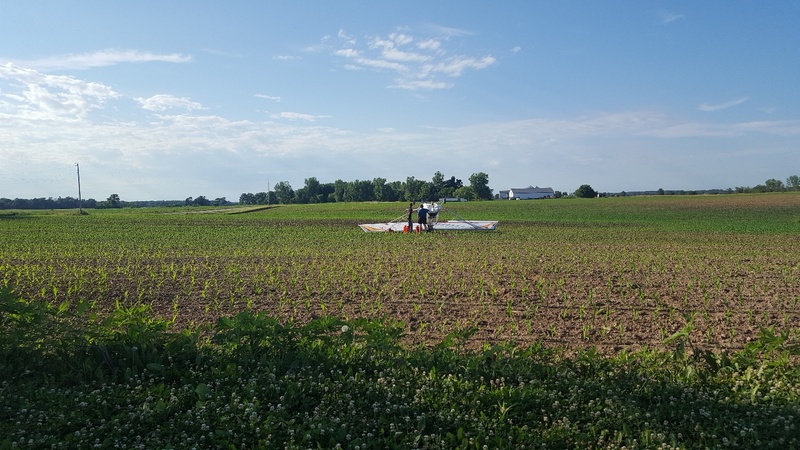 Either 500' was not enough runway, or pilot error. I need to retest the thrust from the motor, but it seemed awesome to me. Maybe I should have mowed the runway? I'm not sure what is to blame. Chopper Girl is building a trailer to carry the PoorGirl. She will come and get it, repair it, add her motor, and take it to an airport for crow hops. It is her dream to fly an ultralight for under $1000. I decided to help her because I will never have time to go to the airport, don't have a trailer, and really, really want to fly from my back yard.